The total value of licences issued for the export of small arms ammunition rose from EUR 27 million to EUR 283.8 million, whereas exports of small arms decreased from EUR 12.4 million to EUR 11.6 million. 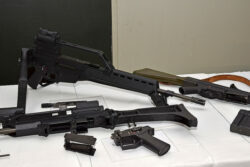 EU and NATO countries (including the NATO-equivalent countries Australia, New Zealand, Japan and Switzerland) imported German ammunition and small arms worth EUR 275 million. Iraq, where Germany supports Kurdish fighters in their battle against Islamic State (IS), purchased small arms and ammunition totalling EUR 5.4 million. There has been significant change in the ranking of the customer countries – among which are some crisis regions. In the first half of 2016, Turkey increased its arms procurement from Germany, going from 25th to 8th place in the list of arms-trading partners. Ankara bought arms worth EUR 76.4 million in the first half of 2016. Aircraft parts, drones, and engines accounted for two thirds of the purchases. Due to growing uncertainty regarding North Korea, South Korea increased its imports to EUR 205 million, moving from 10th to 4th place. Posted in Allgemein, News & Media. | Tagged Deutschland, Kleinwaffen, Krisen- und Spannungsregion, Munition, Rüstungsexporte.